Meet Graham and Kristiann originally from Texas. They ditched the corporate life at a young age and jumped at the chance to run Allende, a 44′ Fountaine Pajot Helia Evolution. Extensively trained in travel (they have seen 40 countries and not even 40 years old), the yacht decor reflects their tasteful and original style. They quickly learned about the best coffee in the Caribbean, and source locally from VI Coffee Roasters in St. Thomas, USVI. This yacht sleeps 6 in 3 queen cabins. Did I mention they have a custom stainless mount for their Big Green Egg BBQ? The owner of this yacht has custom built Skimmer, a 74 foot Open Ocean yacht, to race and to travel around the world with his family. With it’s Kevlar doors and bars for security (you won’t need them for your week in the Caribbean), you can guarantee you will not run out of dinner conversation all week. Sleeps 10 guests in 5 cabins. Deep Blue 1, a Leopard 46′, was completely made over inside and out since its last showing in November of 2016. Captain Greg, a lawyer in a past life, is loving his career change and it shows. 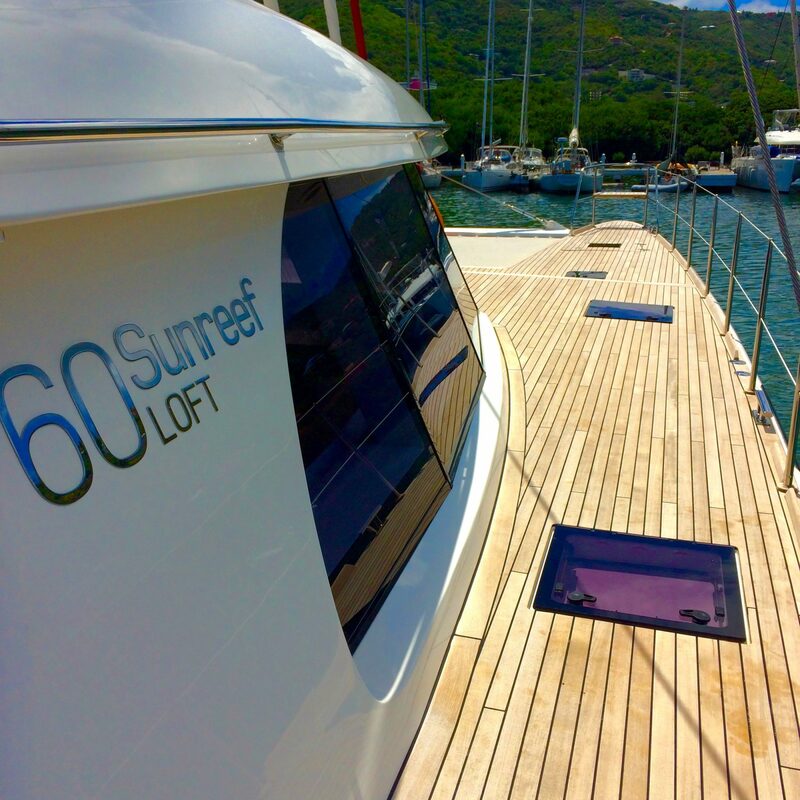 This yacht sleeps 6 guests in 3 queen cabins and comes with free legal advice all week long. Grand Oasis, a classic 60ft Trimaran, sleeps 10 guests. Like riding a jet ski, you just cannot help but have a smile on your face the entire time you are on this boat. Captain Jeff and Chef Savannah make an excellent team. They even have a sweet little puppy who loves sailing if you wish to have an extra crew member. Check them out here.